Window Maintenance | Why is it Important? Window maintenance is vital when it comes to extending the life of your replacement windows. You should be performing an annual inspection of your windows and cleaning them regularly. Below are some tips and information about how to perform maintenance and what to look for. Cleaning your windows is a great way to retain their beautiful appearance and keep your home looking great. Depending on your geographical location, your windows may need to be cleaned more or less throughout the year. For example, homes in coastal locations may need window cleaning three to four times a year. No matter where you live, your windows should be cleaned once or twice a year. Cleaning your windows can also be a great opportunity to inspect for other problems that could be fixed with some preventative maintenance. It is important to clean your windows while they are in shade, this helps to avoid streaking. Working from top to bottom is the best practice if you live in a multi-story home. Starting with the outside of the windows first is usually best because you can then catch any water or cleaner that works its way inside. Planning specific times each year to clean your windows is a great way to make sure it is getting done routinely. It is important to avoid any potent cleaners which can cause damage to trim and sealants. Using a mixture of water and a mild soap first is a great way to break down any dirt and debris. Next, a basic window cleaner like Windex works great. Citrus based cleaners are an excellent option for the interior of the windows if you are worried about spilling on hardwood floors. Using a spray bottle for the interior is another option that can help to avoid spills or splashes on flooring. Do you have some stubborn stains? A toothbrush or blunt rubber scraper can help with those. Using a squeegee at the end will help remove any remaining cleaning solution. Using a non-soy based newspaper as an alternative to towels can prevent pesky fibers from being left behind and leave a streak-free finish. Is a power washer safe? Yes, but it may leave streaks and residue. Best results come from hand-washing/using a squeegee. Maintaining the hardware on your windows is vital to ensure smooth operation throughout their lifetime. Applying a coat of beeswax to the hardware can help restore and maintain finishes. Applying a dry lubricant to the gears will help will help to keep parts moving freely. While chipped paint shouldn’t affect the performance of your window, it will negatively impact the appearance. It is best to repaint windows every 4 or 5 years. When painting the windows, be sure to give them a thorough cleaning before. Also, avoid painting the windows while they are closed and do not paint over the hardware as this will greatly reduce their ability to function properly. Cleaning the weather stripping on your windows can help to remove debris and maintain an optimal seal, keeping the elements at bay. If you notice that the weather stripping is worn out and coming undone, you should replace them immediately. The weather stripping is vital to preserving the energy efficiency of your windows and keeping moisture out. You should contact the professionals that installed your windows and discuss the steps to take for your particular window. If the window is cleaned and still experiencing issues, it may be time for a replacement. 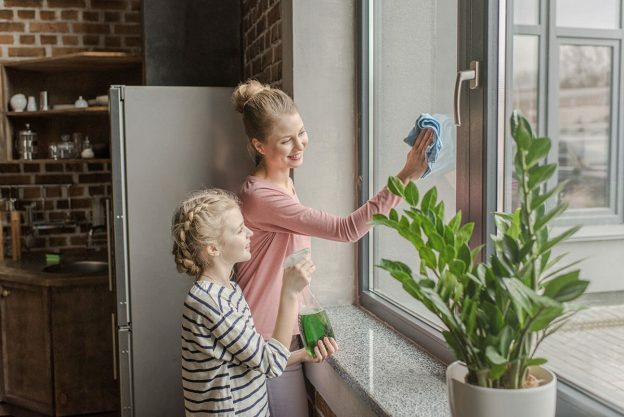 Cleaning your windows on a regular basis is a great way to identify issues before they get out of hand. Some warning signs to look out for include mold, leaking, damaged Wood, and broken window panes. If you identify one of these issues or anything else that you are concerned with, contact your window professional as soon as possible. Addressing problems sooner, rather than later could save you from having to replace the entire window.